One of pMD’s mottos is to work like a beautifully engineered German car: fast, fun, and efficient. As pMD’s in-house attorney, I’m often pulled in the polar opposite direction as I wade through dry, convoluted, acronym-heavy health care regulations. It takes no stretch of the imagination to realize that government health care regulations are not fast, fun, nor efficient. So, one of my favorite challenges is to take this complicated regulatory jargon and break it down to easy to understand language. This week’s challenge: MACRA, QPP, MIPS, and APMs. MACRA is the acronym for a federal law that is officially titled the “Medicare Access and CHIP Reauthorization Act of 2015.” MACRA was touted as the largest health care bill to pass since the Affordable Care Act was signed into law in 2010, and had impressive bipartisan support. MACRA made several changes to existing health care laws, including restructuring Medicare payments. Thus, the law is the newest solution to the ongoing challenge of shifting Medicare payments from fee-for-service to value based. MACRA created the newest evolution of the value based payment model. 2. Alternative Payment Models (APMs). 4. Cost or Resource Use. Each category is weighted differently, with quality as the most influential factor. Small practices can combine to report as a “virtual group” and be scored together on combined performance. The current timeline is to begin measuring MIPS in calendar year 2017, which will influence payments in calendar year 2019. Potential bonuses for high scoring practices range from 4% in 2019 to 9% in 2022. Additionally, $500M has been set aside to potentially be awarded as “exceptional performance” bonuses. Low scoring practices will see equivalent percentage based fee reductions. Standard fee schedule updates will remain flat from 2019 to 2025, when a yearly 0.25% increase will begin for MIPS participants. 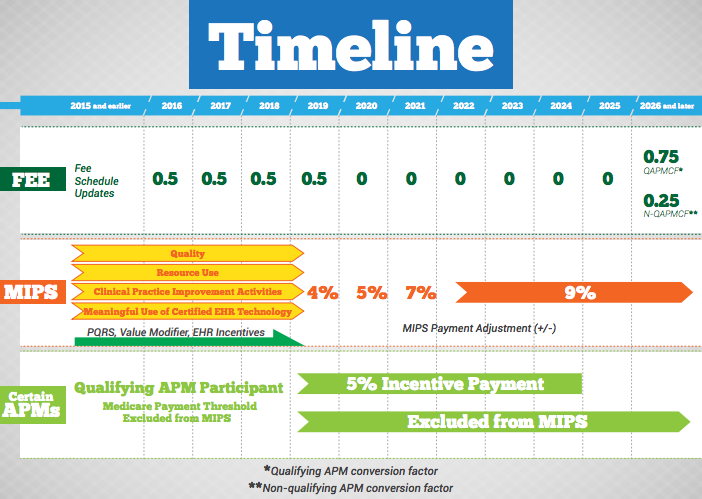 CMS believes that most providers will begin their QPP participation on the MIPS pathway, and then gradually transition towards the APM pathway. Indeed, CMS has created certain incentives to encourage providers to move towards substantial involvement in an APM. The second path to payment offered by QPP is participating in an alternate payment model, or APM. Providers participating in the APM pathway can avoid the reporting mechanisms required by MIPS, and still be eligible for financial bonuses. CMS hopes that eventually a majority of providers will participate in APMs, and thus has further incentivized this pathway within the QPP. However, exactly which organizations qualify as APMs is still unknown. Familiar organizations such as Accountable Care Organizations (ACOs), Patient Centered Medical Homes, and bundled payment models are currently considered to be included. But, MACRA charged CMS with creating an APM certification process so that innovative health care solutions can become certified APMs under the QPP. CMS’s goal is to begin payout of a flat 5% fee increase in calendar year 2019 for all APM participants. As with MIPS, standard fee schedule updates will remain flat from 2019 to 2025, but unlike MIPS, a yearly 0.75% increase will begin for APM participants in 2026. Ultimately, it means that Medicare payment models are changing… again. But, the exact requirements necessary to earn these payments is still open for debate. So, the ultimate outcome of the legislation and how much closer on the path to value it will bring our health care system remains to be seen. MACRA is a law. The QPP is the newest evolution of a value based payment model, which offers two distinct payment programs: MIPS and APMs. The QPP was created by MACRA. The exact implementation plans for MACRA and the QPP takes us back to the world of dry, convoluted, acronym-heavy health care regulations. But, that’s another blog post. At the end of the day, Medicare payment changes once again hover on the horizon. And while pMD can’t advise our charge capture customers on complying with these regulatory payment issues, we can – and do – create fast, fun, and efficient tools to help them propel medical practices through the ever-changing regulatory landscape to success.